I did as many of the Dare to Get Dirty challenges on Splitcoaststampers as time would allow me. I wish I could have done them all, but I am leaving on vacation, so this is my last submission. Bev Mom's sew unexpected - do not own a sewing machine and only know a few basic hand stitches. I hand sewed the bottom right corner under the image with lavender embroidery thread. I "faux sewed" the upper left after I was unhappy with the messy appearance of my real sewing. Ugh! I tried. Becca Stamps - to cut it out - punches and dies - I used an octagon Nestability that I cut some of the shape off for a different look. Pickle Tree - Born to be Wild - bunnies are soft and cuddly and tame, but I reckon there are some wild ones in the bunch, too. DeborahLynneS - taken with texture - dimensionals, dry embossing, and liquid applique (on bunny's tail)--see ya in a couple days, Deb! I wanted a bright, cheery card to send to a woman who was recently diagnosed with breast cancer in the hopes that it might lift her spirits a bit. I'm going to the Michigan U.P. Stamping event for a few days----WOO-HOO!!! I'm looking forward to seeing old friends and meeting new friends and being inspired! I'll have my laptop with me, I don't know if I'll have an opportunity to post or check in with other blogs. But, like Arnold always says, "I'll be back!" Have a fab time away! I like your altered octagonal panel. Every time I see those MFT bunnies I think I must get me one - I'll have to check out what their delivery rates are for overseas. I guess carrots are food, but French and English ladies used to wear the leafy bits because they were so pretty, shame there wasn't a fashion challenge that you sneak the carrots in on too, LOL. I like your cheery colours and am sure that the card will lift and encourage your friend. Cancer is a bummer - I just made my music card today for Deb's challenge, and one of things that inspired me was a friend who died of secondary cancer. At least she had ten years after her breast cancer, and married a lovely man and had two sweet little girls before she got hit by the secondaries. Cute card, Charlene and way to go tackling all those challenges! Give Sharon and Joan Fricker big hugs from me when you get to the UP! Thanks GF for doing my sketch!! Have fun on our travels!!! Too cute! Great textures, love the vibrant bright colors and your faux stitching is awesome! I hope you have a terrific time. It is always so fun to meet up with other stampers. This is adorable. Look at all of those challenges. I wish I had done more. You are ahead of me as I did only one. Great job. I love the stitching. oh this is fabulous! the colors look like kermit below! have a super time. i'm sooo jealous! 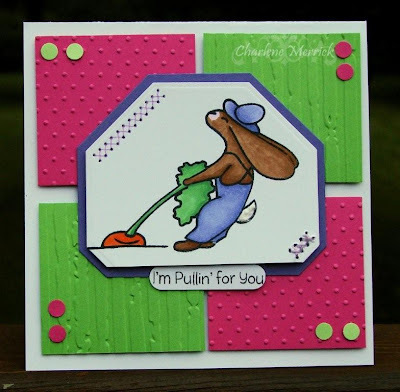 Love your sweet, happy card, Charlene...that bunny is just tooo cute!!!! Do ya think the bunny is digging for snails and frogs....might be jealous about not being invited to the tea party!! Speaking of being jealous, I am sooo green (I almost look like Kermit! )..wish I was going stamping with ya...have a ball, girly...I can't wait to hear all about it!!! OMG, this is awesome everything! Cute image, super colors and what a wonderful design... I'm loving this great card. I agree with Joan, I wish I was going with you. I hope you have a fab time. Until I read your description I hadn't noticed any difference between your faux stitching and the real thing. They both looked real. Maybe I need to get my glasses on!!! SNUGS!!! Great job on all the challenges, Charlene!! Enjoy your stamping time away...heading to CHA tomorrow..woo,hoo!! Have a GREAT time GF! I love your card and I am certain that it will lift the spirits of your friend. I can't wait to read all about your lil vacation and see what cool stuff you create! I musta missed this one along the way! Its way cool...Hope you had fun in the stamp party!! !